These little apparent matches can be very mind boggling. I have 19 overlapping matches on one segment of Chromosome 4 that are between 5.0 and 5.8 Centimorgans in length. These show up in the Ancestry Finder at 23andMe. Six of them begin and end at the same point. The others only vary slightly at the beginning point or the ending point. Adding to my frustration, only one of these 19 has chosen to publicly identify herself, and that person knows very little about her ancestry. Therefore, at present I have no way to contact them to get more information from my matches. The matches seem to be geographically diverse. However, the four who list all four grandparents born in the came country are from Macedonia, Greece, France and Denmark. I'd welcome comments about this apparent cluster. I don't know what to think of these clusters of small matches either without being able to determine if you share more DNA with each of these people. I have recommended to 23andMe that they look into a way for us to contact our Ancestry Finder matches. I know that they are thinking about it. I feel that if a person is interested enough to enter the information needed for AF, they might also be open to inquiries in this regard. The response rate should be higher since the person is already interacting with the site in an Ancestry capacity. 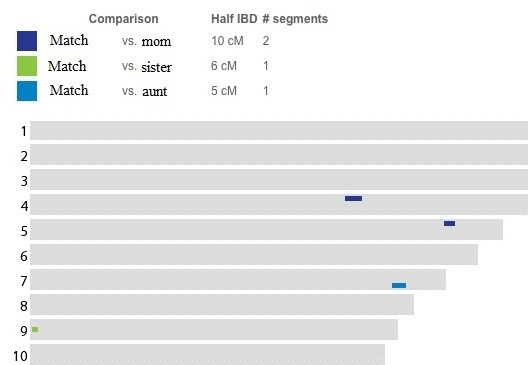 I don't know if you qualify at 5 CM's with me, but according to the HIR search, you are my relative. It might just be a coincidence because we have only one match on chromosome #1 at 402 SNPS. It is quite interesting to read how small segments can indicate old ancestry that transmits as a uninterrupted group. All of this is very knew to me, so my understanding is at the surface level at most!! Anyway I will keep my eyes peeled for any new revelations on how small chromosome segments show sanguinity!! Interesting post. CeCe, is there a cM rule of thumb to identify when it's worthwhile to pursue a potential match? For example, if we have a 7 cM match solely on 1 segment is that long enough to warrant more research? What about a 10 cM match? 15 cM on a single segment? What if there is 1 match of >12 cM and a few little one's (6's & 7's)? Or what about if there were 5 little one's (all 6's & 7's)? Should we disregard any of these or pursue?